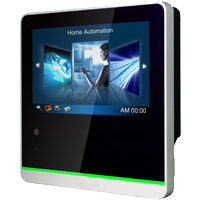 The stylish 5” S-Series HMI is designed to be an ultimate solution for either intelligent buildings or industrial automation. Precise small size perfectly fits in confined spaces. With PoE onboard it can transfer both the data and electrical power, resulting in a reduction of installation costs and power consumption. LED Light Bar helps to control the status of the running processes afar, yet saving energy by keeping the display turned off. Integrated HF RFID / NFC technology limits the access only to the personnel in charge. In addition, a trueflat surface is easy-to-clean and designed to avoid clogged dust and water on the edges.